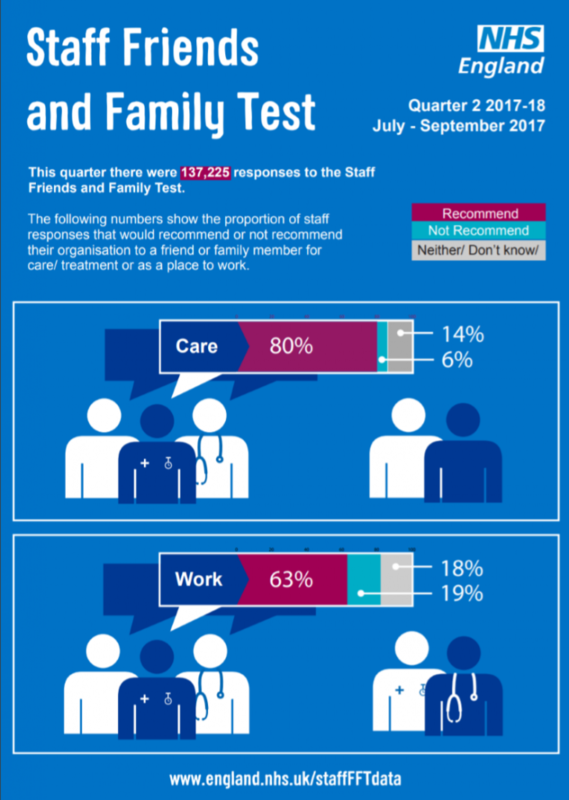 The NHS Staff Friends & Family test measurement for the final quarter of 2017/18 will soon be under way and organisations must be wondering if the current pressures and media attention on the NHS will have an impact on their own results. Previously we have seen that the “Recommendation as a place to work” recommender score can be very sensitive within an organisation and local issues and problems can impact on this score significantly. We have also seen organisations whose “Recommendation as a place to work” score has improved quite dramatically following management and communication initiatives. To explore the link between these scores and the reasons for any change, it is important to be able to measure cause and effect through a dynamic system which can ask specific groups of staff the right questions at the right time, in addition to the standard FFT questions. The COM-Q service from CoMetrica can do that very effectively for organisations, taking all the burden of measurement away from organisations and getting much better than average response rates. This leaves the organisation to focus on the results, not the measuring. For more information about how our flexible service can make the SFFT more useful to you, get in touch with us and we can arrange a demonstration.